All religions have an event or ceremony to mark the admission of new adherents into the community. Baptism marks entry into the Christian community – but it is only a beginning. Baptism initiates a lifelong journey of searching and questioning, contending with evil and injustice, giving love and showing mercy, and discovering with joy the unfolding mysteries of God. Why bring our children for baptism? Parents make many decisions for their children without their consent or understanding. We give food and medicine because we want them to be healthy. We make decisions about their schooling in the hope they will value ideas and develop certain qualities. Children cannot decide for themselves what language to speak, until they know enough language to be able to make up their own minds. We hold our children’s hopes and dreams in trust for a time, until they can make decisions of their own. We bring children for baptism in the same mind, believing they can enter into the mystery of a relationship with God long before conscious commitments are possible. Baptising children is an expression of our hope that the full blessings of God will be active in their lives as they grow and mature. It signifies our desire that each child will develop spiritually, as well as physically, in the way of Jesus and his Church. It is this life we wish for our children. For a child to grow up believing they are wanted and loved by God from the moment of their birth is one of the most wonderful gifts we can give our children. The preparation of adults for baptism is generally a more involved process than that for children, where faithful sponsors will spend many years nurturing their godchildren in the Christian faith. Adults will need to consider their own following of Jesus and their relationship with the Church, and develop a basic understanding of scripture and theology, prayer and reflection. Traditionally, adults begin preparation for baptism during the season of Lent, in anticipation of baptism on Easter day. Sponsors, or godparents as they have been known, accept a particular responsibility for helping children to journey in faith and enter the life of the church. In the case of young children, this may take many years. Godparents, therefore, should be chosen with great care. They do not need to be Anglicans but must be baptised themselves and ought be worshipping members of a Christian congregation. Baptism involves the whole Christian community and baptisms are usually celebrated at the main Sunday Eucharist at 9.30am. Alternative arrangements may be possible in exceptional circumstances, after discussion with the Parish clergy. Baptisms are scheduled to coincide with major church festivals where the themes of baptism are especially pertinent or highlighted. Outside these times, baptism generally occur on the last Sunday of each month. They are not usually performed at all during Lent (six weeks prior to Easter), or at the 9.30am Eucharist in Advent (four weeks prior to Christmas). Baptism is a significant step in life, either for ourselves or our children, and preparing well is important. Parents at Saint John’s join three times with other families to reflect on the themes and symbols of baptism and the promises they will make. Godparents also need to know what they are committing to, so they can exercise their role effectively, and it is desirable that they too participate in the preparation program. What to do I do next? At least six weeks notice is required for baptism, except in emergencies. Please complete the attached Baptism Application Form, or contact the Parish Office to have one sent to you. You will also need to contact the Parish Office to enroll in the preparation classes. 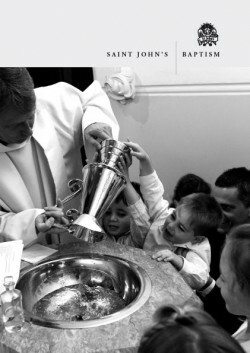 A final decision on baptism does not need to be made in order to participate in the classes, and those who simply want to enquire or know more about the sacraments of the church are welcome to attend.